We fix it for you – our same-day bike repair service. This is for all you folks out there who prefer to spend time riding rather than repairing your bike. We really care about keeping everyone cycling AND we love working on bikes – so we thought we’d combine the two: Repair Tuesdays! Every Tuesday, you can bring your bike to our friendly mechanics and we will assess and fix it for you. Our doors are open on Tuesdays from 8am until 6pm. You drop your bike off in the morning, we fix it, and you collect it THE VERY SAME DAY! Easy. We don’t usually take bookings in advance for Repair Tuesdays, so it’s good to get here early on as it’s “first come, first served” – we start at 08:00. If you do want to let us know in advance that you’ll be coming, or enquire about a more “specialist” job (e.g. taking a bike apart and packing it for shipping/air freight, or changing your whole drivetrain, etc.) then please do just drop us a line by email. All repairs are done by experienced (and very friendly) mechanics and all bikes are test ridden before they are returned to you. 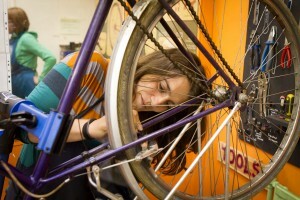 If your bike needs work which will go beyond what can be done in a day, we won’t be able to take it on, but you can always bring it to our drop-in DIY workshops. When you arrive we will give your bike a brief safety check and assess & agree repairs to be done. We offer three levels of bike service, all of which will get your bike running safely and smoothly. All parts of the bike are linked, so we think it’s better to do a full service rather than ‘just fix the gears’. For those who don’t want or need a full service though, we can do most bike repair jobs. Our prices reflect the skill level of our mechanics and the care with which they do their work. The table below shows our labour charges (click here to see what’s included with each level of service). Please note that parts are not included in these prices. Every penny you spend on repairing your beautiful bike will go directly to supporting our work to grow the cycling movement! While you’re at the workshop you can peruse our refurbished bikes, rummage through our used parts, and pick up essential bike kit like tyre levers and gorgeous Broken Spoke tee-shirts. Click here for details on what we sell.